The Bays of St. Augustin and Tullea, on the Western Coast of Madagascar, surveyed in 1755 and 1768. 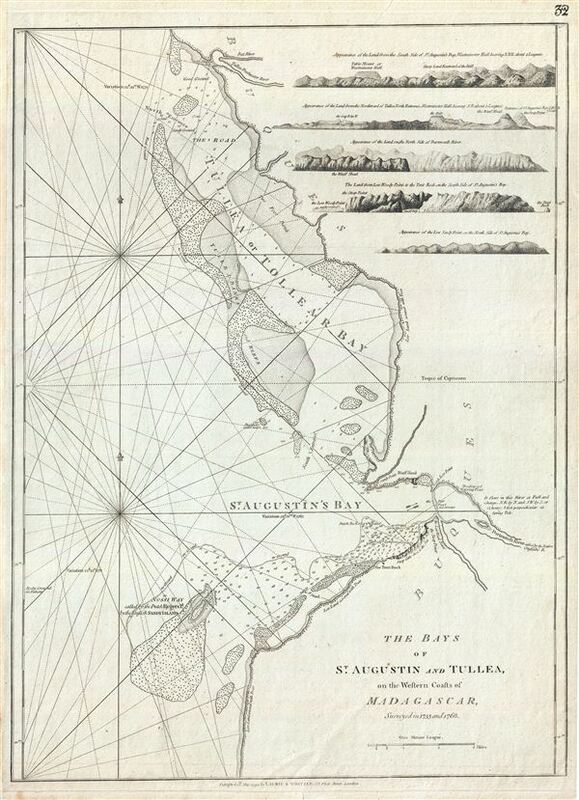 This is a fine example of Laurie and Whittle's 1794 nautical chart or maritime map of the Bays of St. Augustin and Tullea (Tulear Bay) on the western coast of Madagascar. The chart covers part of the modern day Atsimo-Andrefana Region from Toliara to Saint Augustin and Soalara in the district of Toliara II. The mouth of the Darmouth or Onilahy River is also noted. In the upper right quadrant, the map includes five coastal profile views. The Mozambique - Madagascar region was one of the earliest parts of sub-Saharan Africa to be settled and explored by Europeans. In the 17th century, Madagascar, with its forbidding reef-ridden coastline and amicable population became a pirate haven, hosting such infamous buccaneers and John Avery, Henry Every, Thomas Tew, and Captain Kidd. By the time this map was drawn the passages around Madagascar had become particularly dangerous. Madagascar was also home to the legendary utopian pirate republic, called Libertatia or Libertalia, established in the 17th century. When Captain William Kidd visited in 1697 to undertake repairs to his ship, he is said to have lost half his crew to the delights of Libertatia. Nonetheless by 1825 piracy in the region had diminished significantly under continual pressure from European merchant navies. This map was based on the surveys in 1755 and 1768 and was published by Laurie and Whittle from their offices at 53 Fleet Street, London, on May 12, 1794. It was issued independently as well as offered in their 1797 East-India Pilot, or Oriental Navigator.